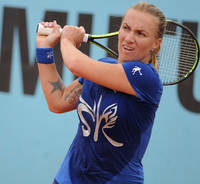 Svetlana Aleksandrovna Kuznetsova (born 27 June 1985) is a Russian professional tennis player. Kuznetsova has appeared in four Grand Slam singles finals, winning two, and has also appeared in seven doubles finals, winning twice. As a doubles player, Kuznetsova has reached the finals of each Grand Slam at least once, winning the Australian Open twice. She is currently the number 8 ranked player on the WTA rankings. This webpage uses material from the Wikipedia article "Svetlana_Kuznetsova" and is licensed under the GNU Free Documentation License. Reality TV World is not responsible for any errors or omissions the Wikipedia article may contain.